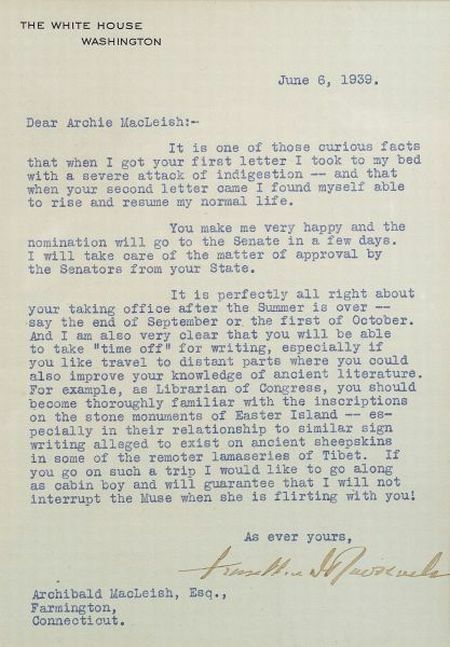 Roosevelt, Franklin Delano (1882-1945), Letter signed, June 6th, 1939, one page, as President, to Archibald MacLeish, his amusing and witty comments concerning MacLeish's response that he would accept the nomination as the next Librarian of Congress, framed, (light fading). 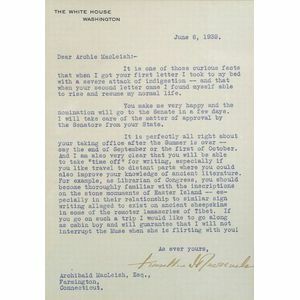 Text in full: Dear Archie MacLeish:-/It is one of those curious facts that when I got your first letter I took to my de with a severe attack of indigestion -- and that when your second letter came I found myself able to rise and resume my normal life./You make me very happy and the nomination will go to the Senate in a few days. I will take care of the matter of approval by the Senators from your State./It is perfectly all right about your taking office after the Summer is over -- say the end of September or the first of October. 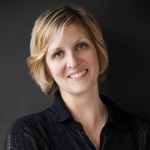 And I am also very clear that you will be able to take "time off" for writing, especially if you like travel to distant parts where you could also improve you knowledge of ancient literature. For example, as Librarian of Congress, you should become thoroughly familiar with the inscriptions on the stone monuments of Easter Island -- especially in their relationship to similar sign writing alleged to exist on ancient sheepskins in some of the remoter lamaseries of Tibet. If you go on such a trip I would like to go along as cabin boy and will guarantee that I will not interrupt the Muse when she is flirting with you!/As ever yours,/Franklin D. Roosevelt.